Officers fulfill a holiday wish for a Waldoboro woman by bringing Tessa, a 14-week-old border collie, from Virginia. A puppy made it from Virginia to its new home in Maine on Sunday, thanks to the Bangor Police Department. Two Bangor police officers, who escorted a Wreaths Across America convoy to Arlington National Cemetery last week, picked up the puppy at the request of a Waldoboro woman who contacted the department for help after learning about the trip to Washington, D.C. The puppy, a 14-week-old border collie named Tessa, was adopted by the woman – identified only as Chris on the Bangor police Facebook page – who had no way of transporting the canine to Maine before Christmas. A stranger donated a bag of dog food for the journey. 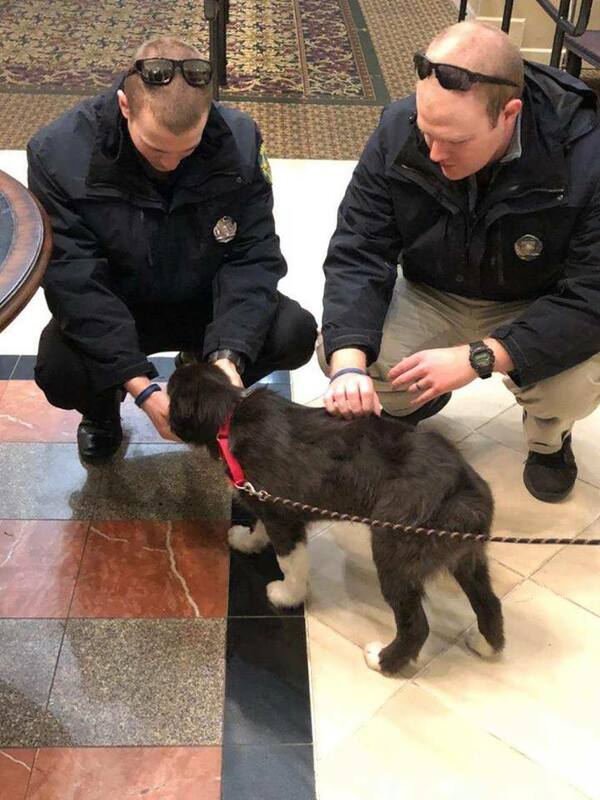 The officers picked up the puppy from its foster mother, Beth Foster, at a hotel lobby Sunday morning and started driving north. The trip was going well Sunday. “Additionally, Tessa’s inner plumbing is working well, she is a good traveler, and does not appear to mind riding in the back of a police cruiser,” Cotton said.